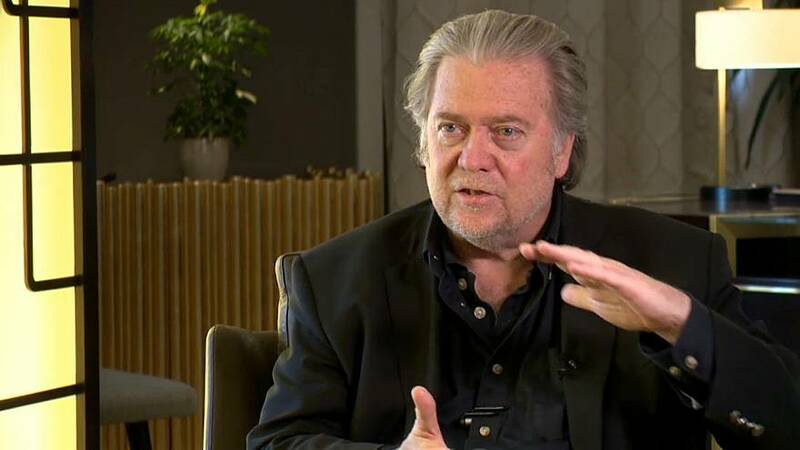 Euronews' Bryan Carter sat down with former White House chief strategist and Breitbart co-founder Steve Bannon in Budapest. The pair spoke for around 45 minutes about the populist movements in Europe, the policies of the Trump administration and the role of the media. You can watch the full exchange on the video above. 8'14 "Economic nationalism does not care about your race, does not care about your gender, does not care about your ethnicity, does not care about your religion, does not care about your sexual preference. Only thing it cares about is you're a citizen"
18:16 "You guys love liberal democracy until you start losing elections. Once you start losing elections, because you're getting smoked throughout Europe, once you start losing elections, all of a sudden it's playing with fire." 24:50 "Do you have any idea who these people [immigrants] are? Do you know if they are ISIS, do you know if they are radicalised? This is the kind of nebulous thinking that causes countries to get into trouble." 27:25 "Victor Orban I think is a hero, he's a hero to the populist movement across the world"
30:14 "That's one of the reasons, by the way, that the opposition political parties are so weak and don't really have the muscle mass to take on the populist nationalist movements, you're seeing this in the United States, the Democratic Party doesn't really have a response, they have leaned so heavily on your parent company NBC, they've leaned so heavily on CNN, they've leaned so heavily on the opposition party media." 32:22"Germany are deadbeats, as you said they are very wealthy, they've got a budget surplus, they are at the frontline of Nato, one of the building blocks of it and yet the two percent minimum, I don't think they have ever reached it"
37:30 I think the European Union will still be around [in the future]. I think it was going down a path of being like the United States where these nations states gave up their total nationhood and were being part of some bigger organisation I think what you are seeing today when I say Brave New World I think what you are going to have: Number one with populism I think you are going to have people with much more control of their sovereignty and their citizenship, and I think in Nationalism what you are going to have is a collection of robust nations."